Welcome to the 2019 edition of my dark horse Cy Young candidates. I’ve been putting together a list of dark horse Cy Young candidates since 2015 when I was writing for a different site. The topic was assigned to me by my editor, and ever since then, it’s been a little pet project of mine. I had major success in my debut season, with two of my dark horses winning the prestigious award. Aside from 2015, I haven’t had a place to publish my candidates save for Twitter and Google Docs, so I decided to issue it on The First Out At Third, an — other than this yearly article — exclusively Milwaukee Brewers website. You can find my past picks here, and once the 2019 season begins, I’ll post a link on Twitter that allows you to follow along with my candidates. Let’s see who I think will take a huge leap forward this season and fight for some Cy Young votes. McHugh is set to return to the starting rotation after spending all of the 2018 campaign in Houston’s bullpen, a place in which he was light-out dominant. In 72.1 innings, the 31-year-old struck out over 33 percent of batters he faced, while hitters batted just .175 against him, good enough for the 10th-lowest mark among qualified relievers. In the end, his season numbers were more than impressive, as McHugh finished with a 1.99 ERA and 2.72 FIP. Only five relievers had a lower ERA. McHugh wasn’t sent to the bullpen because he was struggling as a starter. Far from it actually. The Astros were just so deep with starting arms that McHugh — along with Brad Peacock — were the odd-men out. McHugh has actually performed very well as a starter in his career. In 645.2 innings, he owns a 4.00 ERA and 3.73 FIP. His time in the bullpen allowed him to work on a few things, one being his slider. McHugh’s slider was a nightmare for right-handed hitters last season, as they hit just .135 against it. McHugh also increased his fastball velocity by nearly two ticks. The veteran hurler and podcaster is obviously not the best pitcher in Houston’s incredible rotation, and he’s definitely not the most noteworthy, but if he’s as dominant as I think he will be in 2019, fans all across Major League Baseball will begin to know his name. In his third season in the big leagues, Taillon tallied his best year in 2018. The 27-year-old posted career lows in ERA (3.20), FIP (3.46), strikeout rate (22.8%) and WAR (3.7) across 191 innings. It’s fair to say he broke out, though I believe an even greater breakout is on the horizon. Taillon — a former top 100 prospect — has been able to increase his strikeout rate every year, while never struggling with control. 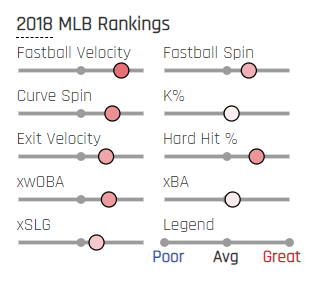 With a power sinker at 95 mph and solid spin (75th percentile) on his curveball, I see no reason why his strikeout trend shouldn’t continue this upcoming season. In fact, a considerable leap in strikeout rate wouldn’t surprise me. Take a look at his StatCast ranks from 2018, and you’ll see he’s above average in numerous key categories. In order to pitch like a Cy Young, though, Taillon will have to work on keeping the ball in the yard. While 20 home runs allowed isn’t necessarily a terrible number, his 11.7% home-run-to-fly-ball ratio was the 30th-highest mark in all of baseball. Again, not terrible, but in an extreme pitcher-friendly stadium like PNC Park, that’s just too high, and it needs to come down. The Pirates won’t be good in 2019, and they won’t be very much fun to watch, but Taillon could change that when he’s on the mound. A Blake Snell-like breakout could very well be on its way. If you were to guess who the top five qualified starters in strikeout rate during the second half of last season were, you’d probably come up with four of the five. It’s likely, however, that you’d miss Marquez. That’s right. Only Justin Verlander, Max Scherzer and and Jacob deGrom struck out batters at a higher rate than Marquez in the second half, a half in which he was making everyone swing and miss. The 24-year-old (oh my god, he’s only 24) struck out hitters at a 33.9 percent clip on his way to a 2.61 ERA and 2.25 FIP after the All-Star break. On the season as a whole, Marquez finished with a 3.77 ERA and 3.40 FIP. Marquez’s ability to generate whiffs is why I love him in 2019. He finished in the top-15 in swinging-strike rate, and 186 of his 230 punch outs (80 percent) came on a swing and a miss — eighth-most in MLB. Because of his absurd finish to the year and the fact that he likely hasn’t even reached his best yet, you might see Marquez on many lists like mine. However, pitching in homer-happy Coors Field doesn’t help him. It really doesn’t help him. The Colorado Rockies are one of four teams that have never had a pitcher win the Cy Young award. By that fact alone, Marquez is a dark horse. Berrios started 25 games in 2017 and 32 games in 2018, and he somehow managed to put up nearly identical stats in both. As the table clearly shows, Berrios essentially duplicated his 2017 season last year. However, there is one stat I knowingly left off the table. A stat that shows he actually improved in 2018 more than we may think. And that’s strikeout rate. Berrios increased his strikeout rate by nearly three percent from 22.6 percent to 25.4 percent. Only 17 other starters can say they had a higher strikeout rate than him. Not too shabby for a 24-year-old kid, eh? What’s even more impressive about that is Berrios is doing it without over-the-top impressive StatCast numbers. His fastball velocity is barely above average (58th percentile), and his curveball that he throws 30 percent of the time is well below average, sitting in the 37th percentile range. Despite that, though, Berrios started getting more whiffs via his curveball in 2018, and that greatly aided his overall strikeout numbers. Berrios also does a good job of limiting hard contact. The average ball hit off him was hit at a speed of 86.1 mph, while his hard-hit rate was above league-average, as well. Berrios is set to lead the Twins’ rotation, and could very well be on his way to a memorable season. Like Taillon, though, he’ll need to do a better job of limiting home runs if he expects to pitch with the big guns. Who needs Dallas Keuchel when you have Nick Pivetta is a sentence that has never been written or said until now. But I believe it to be true. Pivetta recorded a 4.77 ERA in 2018, which isn’t good, so you might be wondering how and why he’s one of my candidates. Well, as you know, ERA rarely tells the entire story, and Pivetta’s peripherals are far more encouraging. Pivetta was the owner of the second-largest gap between his ERA (4.77) and FIP (3.80) last year. His ERA minus FIP was 0.97, trailing only Jon Gray‘s total of 1.03, meaning Pivetta was the victim of some rotten luck. A lot of Pivetta’s struggles can and should be blamed on Philadelphia’s record-breaking terrible defense, which should be much-improved this season. Add another reason to be encouraged by Pivetta. Even Pivetta’s expected stats — which are based on launch angle and how hard a ball is hit — say he had bad luck. He allowed a .339 wOBA, while his xwOBA (expected wOBA) was .311. His expected batting average was .237, yet he allowed a .255 average. Long story short, Pivetta pitched much better than a 4.77 ERA. And I haven’t even gotten to the best part yet. Pivetta — who just turned 26 — was a top-15 pitcher in strikeout rate. He struck out 27.1 percent of batters he faced, while walking only 7.4 percent. His K-BB% — which is a good indicator of future success — was the 12th-highest mark among his peers. Guys, Pivetta is a damn good pitcher. With more luck and a better defense behind him, his standard numbers should begin to reflect that. Watch out for him in 2019. This entry was posted in Cy Young and tagged Collin McHugh, Cy Young, German Marquez, Jameson Taillon, Jose Berrios, Nick Pivetta on February 24, 2019 by Justin Schultz. 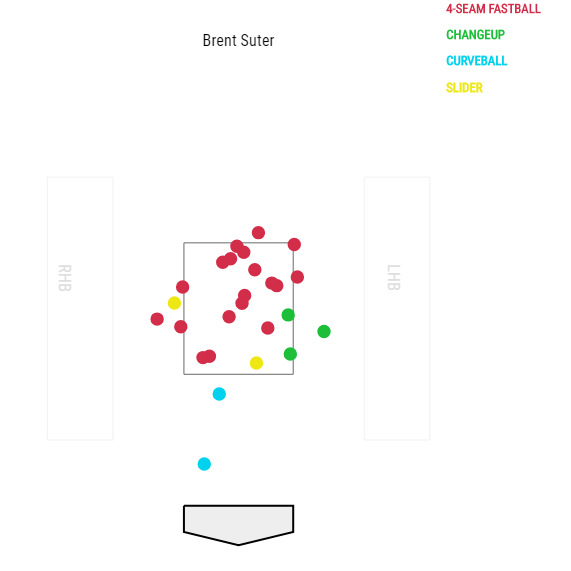 Brent Suter is a fascinating pitcher for numerous reasons. Whether it’s his quirkiness in the Brewers dugout, his ability to homer off Corey Kluber or the fact he allowed the third-lowest average exit velocity in all of baseball, it’s not hard to find something interesting about the lanky lefty. Unfortunately for him, and frankly, for fans of baseball, Suter won’t be pitching anytime soon. Suter underwent the dreaded Tommy John surgery in late August of last year, effectively ending his 2018 season and calling into question his availability for 2019. There’s a chance Suter could return to a major league mound late in the season, though that remains to be seen, and quite frankly, it seems a bit optimistic. So while we wait for Suter to heal and for this dreary winter to end, I thought it’d be fun and enlightening to write a post about yet another weird statistic authored by the man, the myth, the legend. Last season there were 110 pitchers who faced an opposing pitcher a minimum of 10 times. Six of those pitchers failed to allow a hit to their counterpart — Freddy Peralta, Carlos Martinez, Wade Miley, Jacob Nix, Jarlin Garcia and Stephen Strasburg. The other 104 pitchers weren’t as lucky, as they all allowed at least one hit to pitchers. Notice how Suter was one of the unfortunate ones. Well, that’s because Suter had an incredibly difficult time against his opposite number. He faced 26 pitchers in total and somehow, almost impressively, gave up seven base hits, equating to a .269 batting average. Only two pitchers — Matt Koch (.316) and Ty Blach (.308) — allowed a higher average than Suter. He also allowed a .251 wOBA (six singles and one double) against pitchers, which was seventh-highest mark. 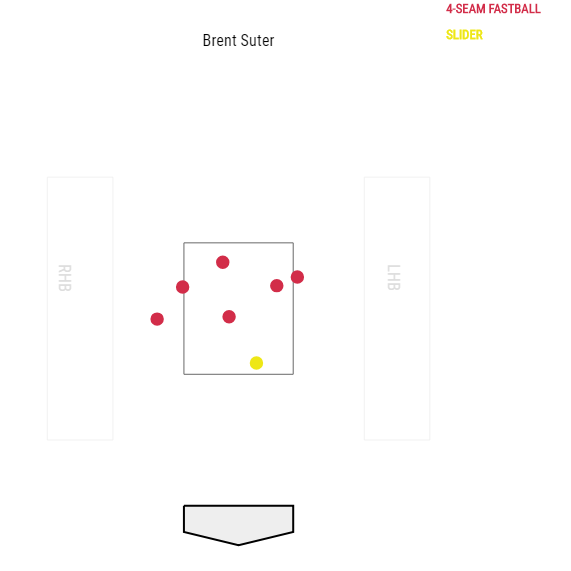 Here is every pitch Suter threw to a pitcher that ended the plate appearance. That’s 19 four-seam fastballs, three changeups, two curveballs and two sliders. The first thing that jumps out at you is the number of fastballs and the location of those fastballs. However, diving deeper into Suter’s pitch arsenal, it’s really not surprising he utilized his four-seamer so often. He threw it 63.5 percent of the time during the regular season, ranking as the sixth-highest rate in all of baseball. The location, though, is more troubling, as nearly all of his pitches ended up high in the zone. Here is the pitch location of every base hit Suter allowed. Five of the seven hits were on pitches in the middle-to-upper part of the zone, and all but one came via the four-seam fastball. The only hit Suter gave up to a pitcher against his slider was to Rockies’ hurler Kyle Freeland. That happened on May 12 when Freeland roped a grounder through the right side of the infield. Granted, that ultimately should’ve been a single, but since Domingo Santana (I miss you) took a poor route, Yu Darvish landed on second base easily. Though it’s not like Darvish didn’t deserve a base knock there. He crushed Suter’s offering for an exit velocity of 99.5 mph. It came in at 86 mph and left the bat nearly 14 mph faster. For a pitcher, that’s eye-opening. The fact Darvish crushed one at nearly 100 mph should be the most embarrassing moment of Suter’s life. As I mentioned earlier, Suter allowed the third-lowest exit velocity in MLB to all types of hitters at 83.7 mph. Meanwhile, against pitchers, Suter allowed an average exit velocity of 69.5 mph or the 18th-lowest velocity among qualified pitchers. It makes little to no sense that Suter struggled so much against pitchers. Essentially, Suter’s troubles against hurlers were more bad luck than anything else, and honestly, this means absolutely nothing going forward. The fact he gave up seven hits to pitchers doesn’t mean he’s going to get blasted by them again next season, health permitting. This is just one of those articles that breaks down an irrelevant, yet entertaining, statistic. This entry was posted in Pitcher vs. Pitcher and tagged Brent Suter, Milwaukee Brewers on February 11, 2019 by Justin Schultz.